I have been kicking back and doing some late summer sketching, how decadent is that. No exhibitions on the horizon, nothing to do but please myself, so I am sketching in my journal and just about to set myself up to do some book binding, a few little sketch/note books I have wanted to make for ages. I have a long weekend up in Castlemaine and it is coming into my favourite time of the year up here, Autumn, crisp, sunny, warm days and cool nights. I am just going to let go of the fact that we never really got a summer this year, stop pouting and just enjoy autumn now it is here. This picture is of Hannah in the sun, this is her favourite morning spot, it is in the sun, she can survey the yard to make sure no marauding cats dare to enter her territory and most importantly she can keep an eye on me in bed to see if I am getting up to make her breakfast yet. 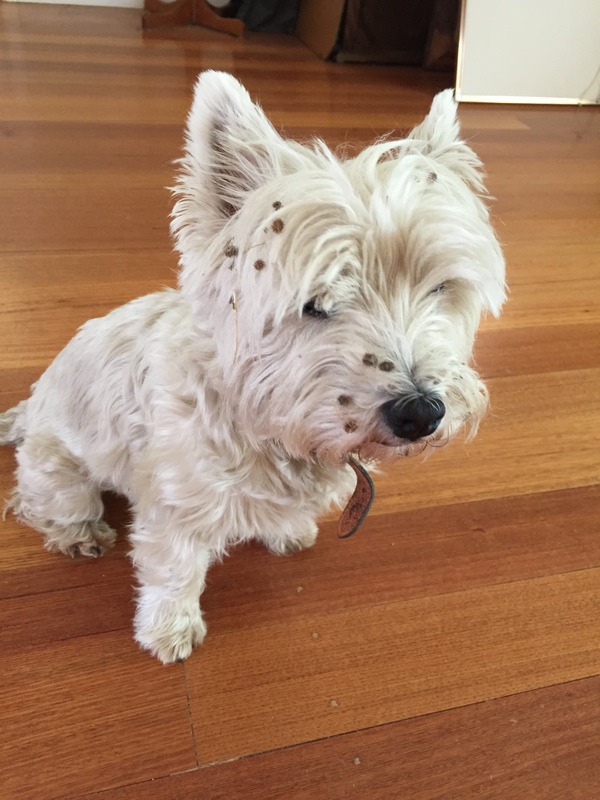 She is a very shaggy westie in this picture as it was just before she was clipped. What a burr seeking magnet she was, I don’t know where she found them, but every time she went out she would come back covered in burrs and would sit impatiently while I picked them all out. 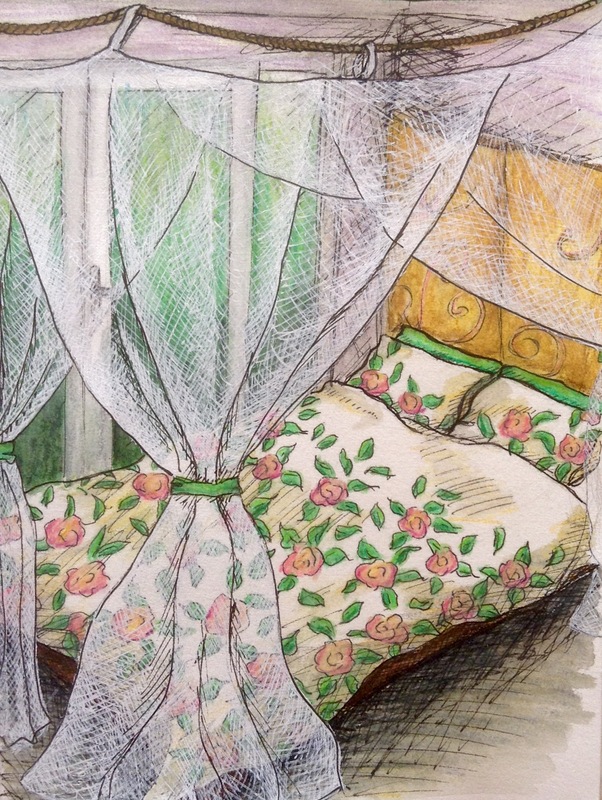 The other drawing is of my bedroom festooned with the summer mossie net. I am not usually a girlie girl, but I have to say I secretly love my romantic bedroom, draped netting, floral doona cover and french doors to the greenery outside. I feel like a princess when I crawl into bed. Wasn’t sure how I was going to draw the mossie net, but ended up painting the picture then went over it with a white gel pen, fairly happy with how the worked out, bed a bit wonky though, but I am embracing the wonkiness and having fun. Hope you enjoyed the glimpse of my late summer decadence. PS Having just read my last post I apologise for a few typos that crept in, I promise I do proof read but when I am tired I just don’t see. So if they do creep please be patient and realise I am just having a bad fatigue day. In the last post I did a look back at what I had been doing in my sketch books, so I thought it would be a good idea to show you a couple of my drawings that I have just finished. The first one is of a florist shop called Pollen which has the most stunning displays, always a joy to go past and its setting is lovely. 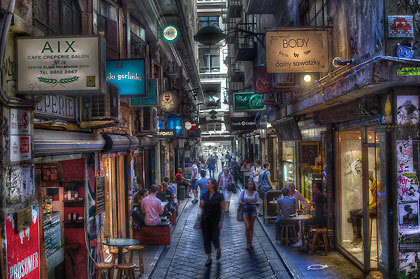 It is in Flinder’s Lane which is one of the trendiest lanes in Melbourne. A lot of the best restaurants are tucked away in this lane and walking down it is always a treat. Melbourne has become world renowned for its colourful laneways full of one off, cutting edge bars and restaurants, bespoke little shops and the really high quality graffiti. Melbourne council made a decision years ago to grant licenses to little hole in the wall venues in the CBD and all of a sudden the laneways which where dirty, smelly and a place you wouldn’t go down, turned into vibrant bar and restaurant precincts full of small and quirky venues. 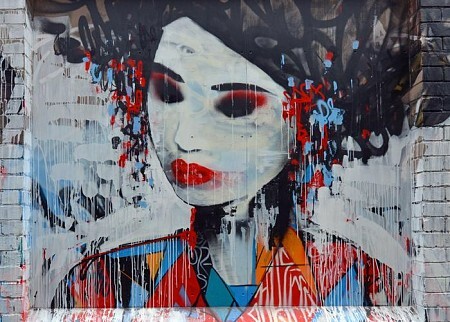 Instead of harassing the graffiti artists they were embraced and encouraged to work in certain locations. Melbourne is now consulting with other international cities on how to conduct urban renewal. 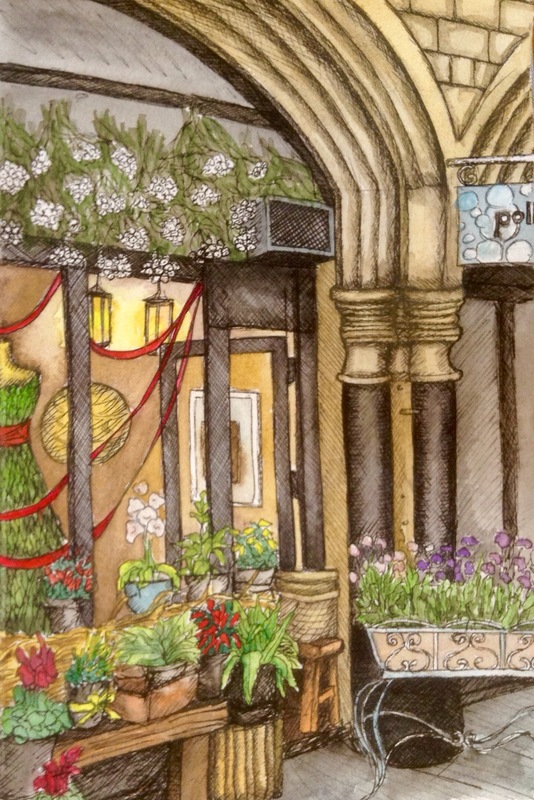 Ok, so back to the picture, Pollen the florist is tucked into the old chapter house of the large sandstone Anglican Cathedral, hence the beautiful of arches above it. It looks like in could be in the back streets of Paris. I am getting fond of the dusk lighting when there is still enough daylight to see, but the lamps begin to glow. it has brought out the pop of the white and other coloured flowers and given depth and a bit of mystery to the picture. My other picture is of a lovely cottage garden in the country at Castlemaine. It is also in an historic setting as the cottage in the back is one of the best preserved miner’s cottages in the district. It is called Tute’s cottage and is was built in the gold rush in 1860s and since 1922 was lived in by the same family until 1997. The last woman to live there must have been very tough to live in such primitive conditions as very little had changed and very short. The doorways are tiny, they must only be 5’7′” high. The garden has been replanted to replicate a gold mining garden and is being maintained as a community garden by a group of residents who live across the road from it. It is a fantastic and productive garden full of heritage varieties. 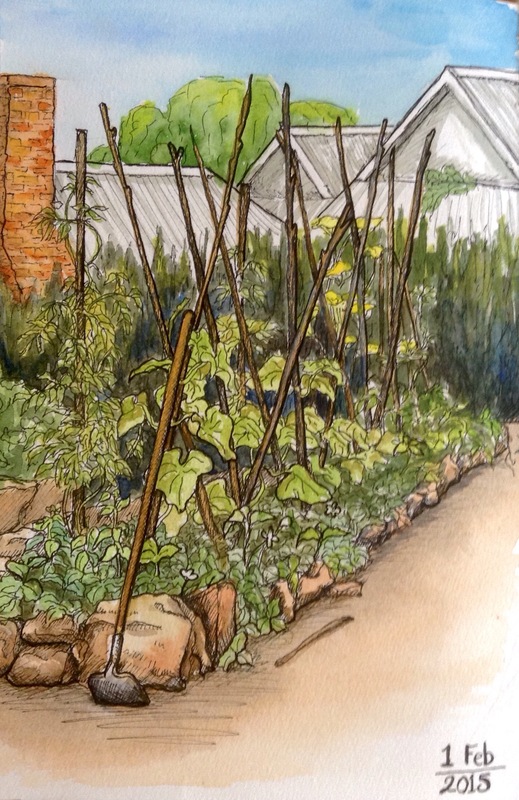 This is my idea of a perfect vege garden, structured but still loose, no formal rows and lots of inter-planting. Good height variety with the home-made trellises made from the fruit tree prunings. I think Peter Rabbit would have been very happy here. I thought I would show one of the first sketches I did in my book, it is nice to look back and think that I have improved. 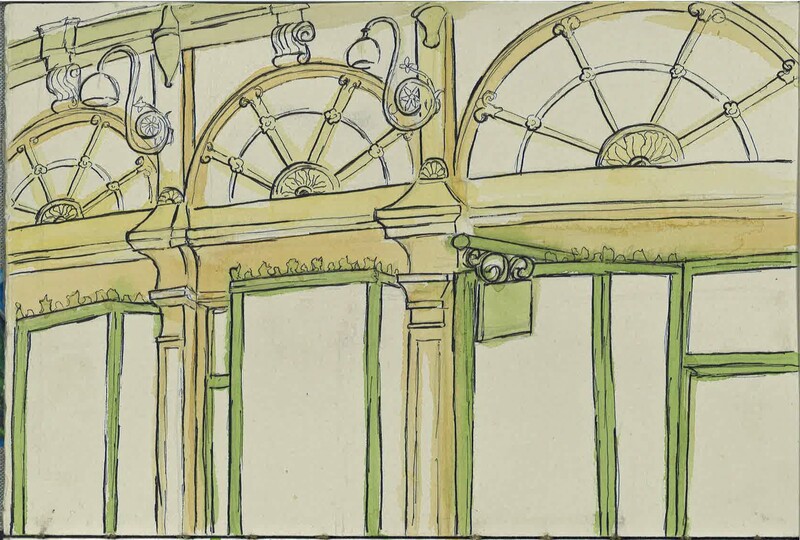 They were both down in the same time frames, about 90 minutes on site and the same amount at home to finish the drawing and add the water colour. I can sure fit in a lot more detail now and am so much more confident. 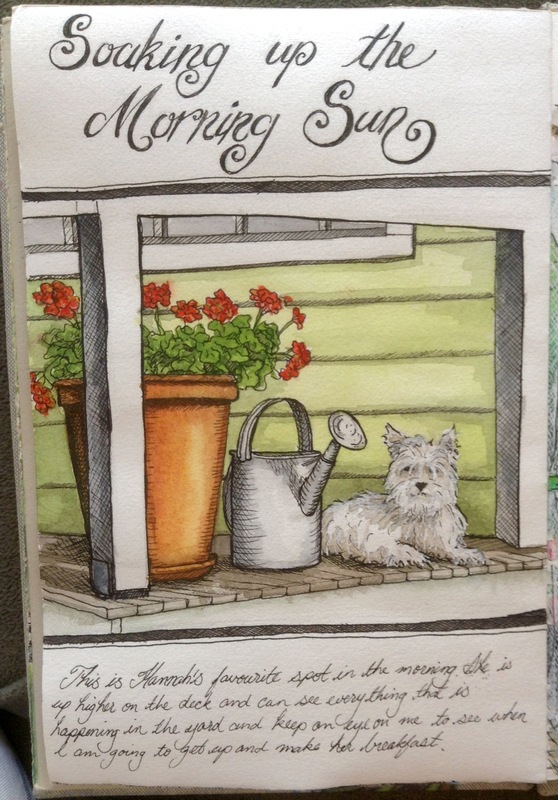 Sketchbook Skool courses have really helped me to develop my skills. 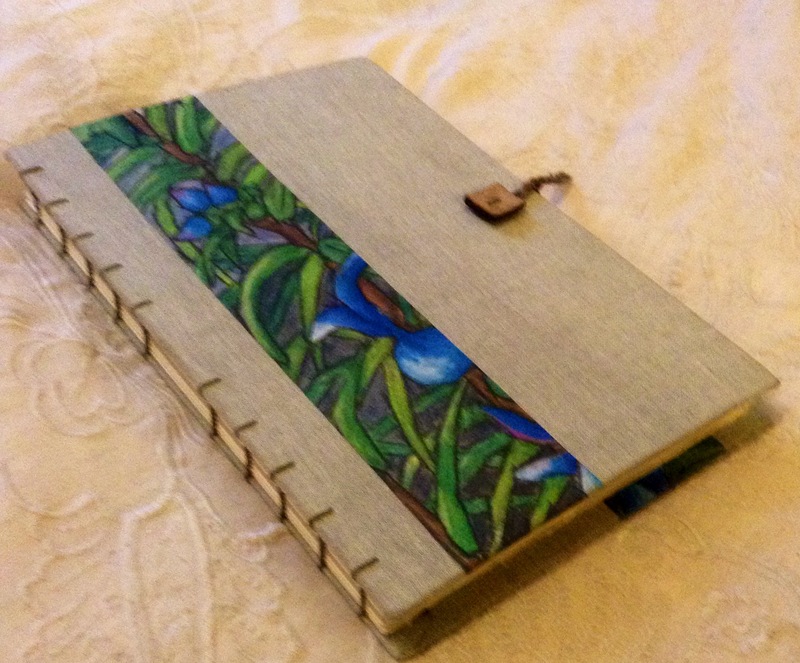 It has been a year since I made and started using my journal and sketch books. I cannot tell you how much I have enjoyed the experience and how it has enriched my life. It is on par with starting this blog, which is also now three years old. Funny I am not into new years resolutions, but I do reflect on each year as it starts and think what I would like to do in that year to enrich my life. February does seem to be the month that I start on the new plans, something I just realised as I write this. 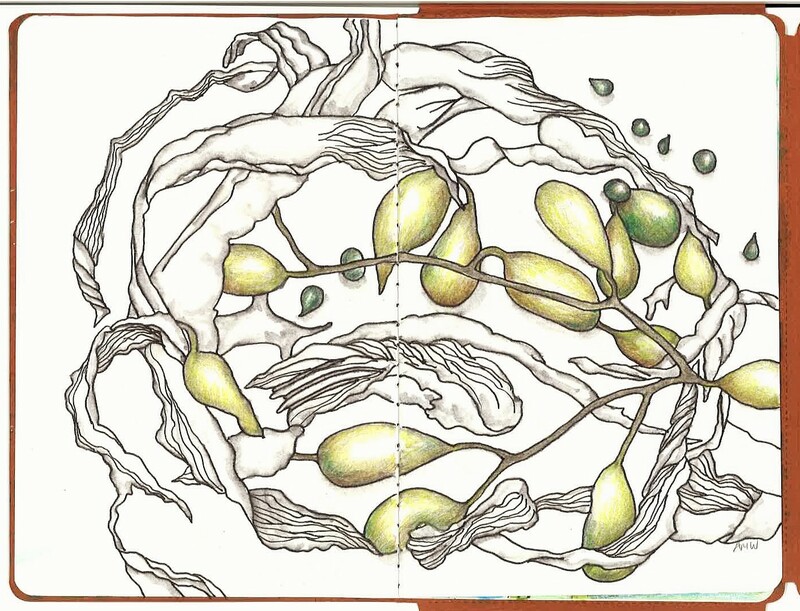 One of my favourite spreads in my journal combining pattern, sketches and thoughts on the time of year. This blog has given me a vehicle to share my art with the world and the friends I have made in doing so has been marvelous. Their kind and supportive comments have given me the courage to exhibit my art and to think that it has merit in the artistic community. I have also learnt a great deal from the artists that I follow and the generous sharing of their skills and practice. My journal and sketch books have also given me a great deal, I have tended to draw and experiment more and to keep these sketches in one place to look back on. Before most of the drawing I did was of finished pieces of art and I was not practicing my skills as much as I thought was needed. This playing around in the sketch book has broadened what I do now and I have been able to expand my practice. I was able to play with patterns and these turned into the art work that went into my exhibition. 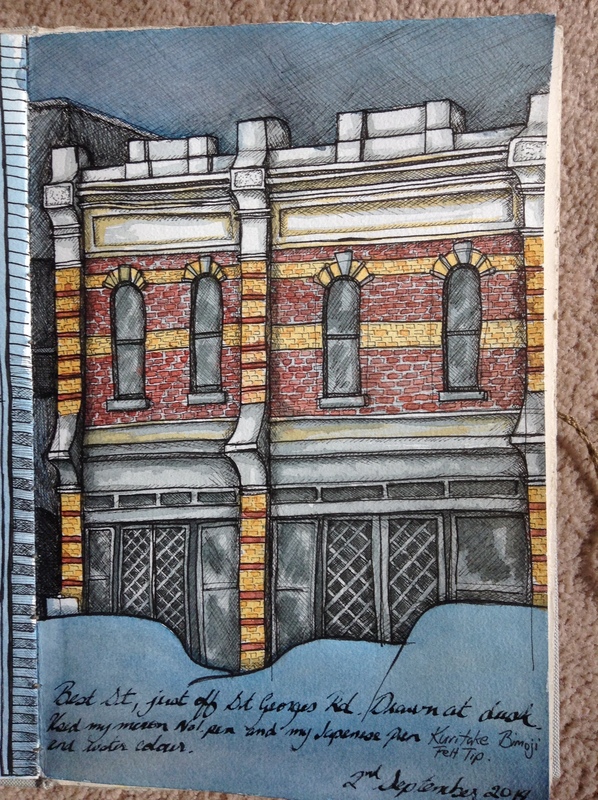 Dusk in Fitzroy from my Sketch book. Another drawing I did while waiting to meet a friend for dinner. 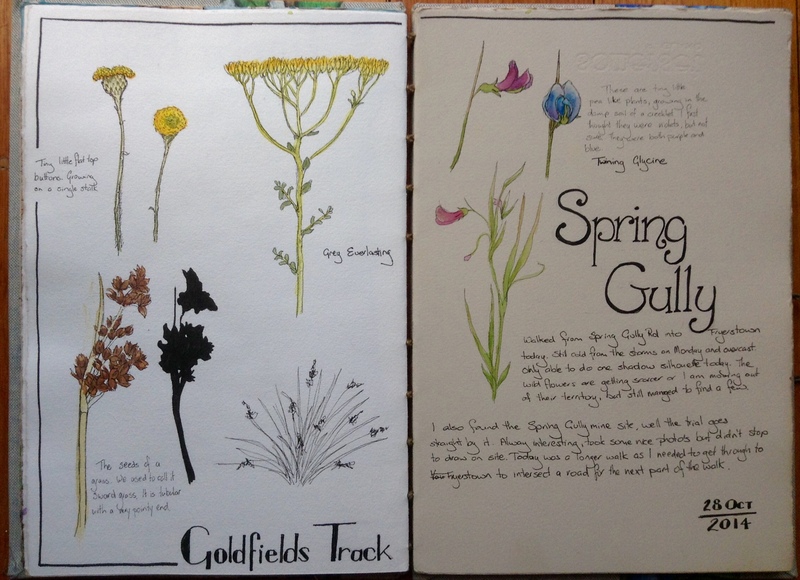 I started with the Seasons of Colour journal where I do random drawings with a rough nod to the season. I started the sketch book in July and it is where I do drawings of my surroundings and I take with me when I am out and about. My drawing skills have improved a great deal and my confidence in being able to draw what I see has improved greatly. The online courses in Sketchbook Skool and joining Urban Sketchers group have influenced what I do in this sketch book and have been a great place to learn and be inspired to sketch. I have found that I enjoy taking the time to do sketches on site and am partial to setting my self up to draw in a cafe with a glass of wine waiting to meet up with friends for dinner or just as a great way to spend quality time with myself and my art. One of the other great joys is going back over the year in the sketch books and seeing such great reminders of what happened over the year and what resonated with me enough to be put into the sketch books. 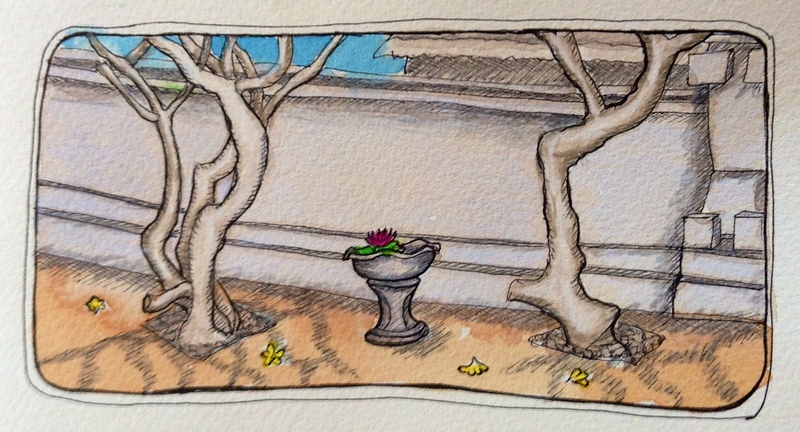 The memories of holidays are so much richer from the sketches that I did while I was away. So here is cheers to the joys of sketching and blogging, they have become an important part of my life, thank you. A page from my sketchy walks, a favourite pastime now. It has changed the way I walk in the bush. The art in this post is from an artistic collaboration I am lucky to be part of with the fabulous Anna Warren. 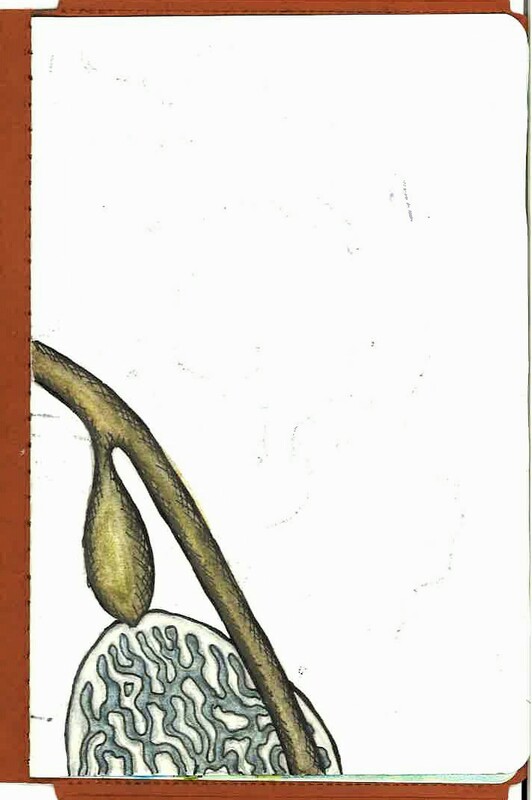 In mid January, Anna posted a drawing that she had done in a little Moleskin Booklet she had collected some time ago. She wondered if anyone would like to join her in filling up these little books and as they came with a folder they were just made for posting. I jumped at the chance as I love Anna’s work and how much fun to work with her on a project. Anna accepted my offer and Kylie Fogarty (a great artist from Canberra) is joining us and we will each work on a double page spread in the booklet and each contribute to a picture on the front and back pages. I was so excited when the first booklet arrived and I have kept to the sea theme of Anna’s drawing. 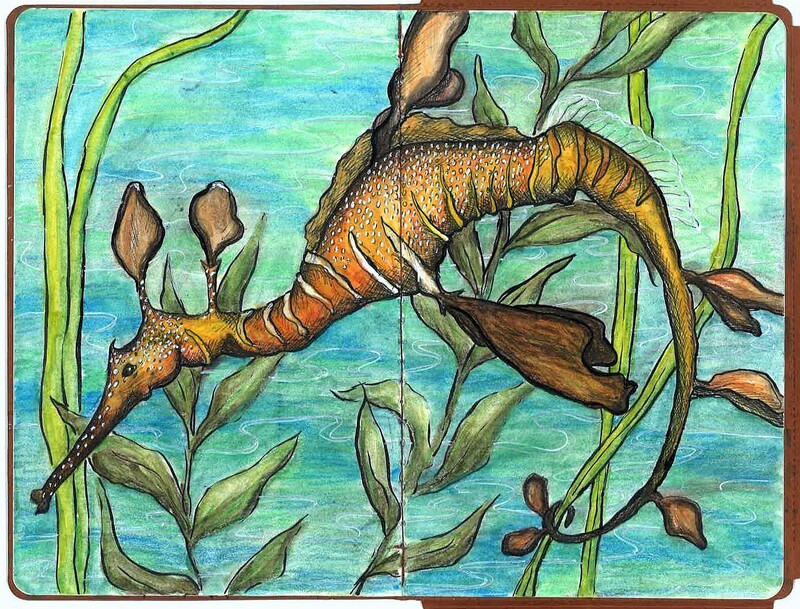 I decided to draw a Weedy Sea dragon, they have always fascinated me and they live in Melbourne’s Port Phillip Bay, not that I have seen them in real life, they are very illusive. 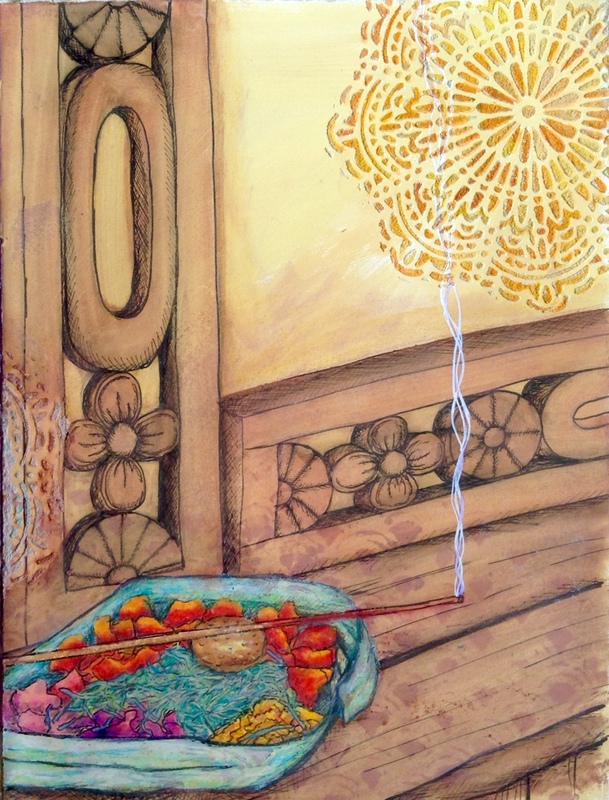 I used my new Derwent Graphitint pencils. 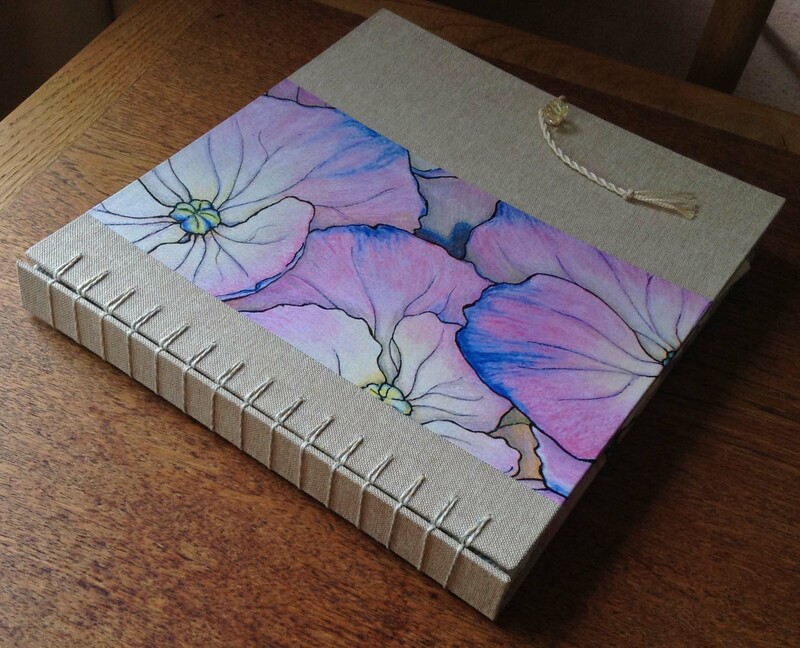 I have found them a lot of fun, they have such lovely muted tones and work well with my other water colour pencils. 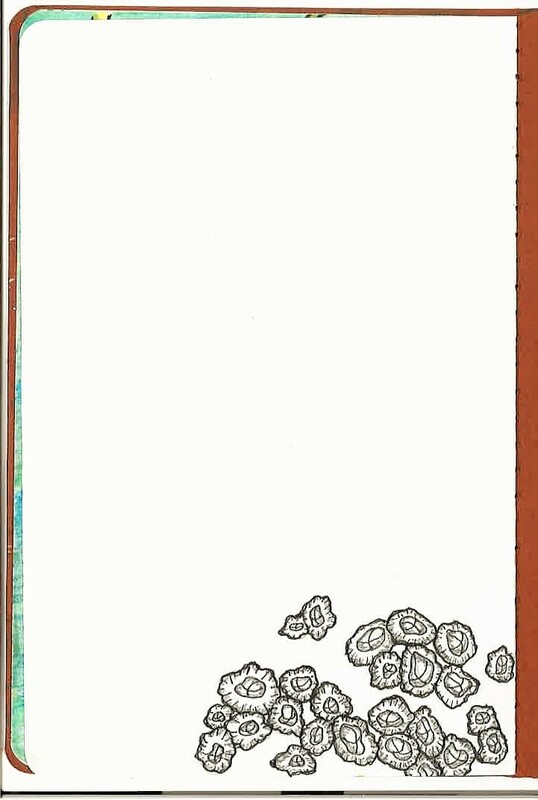 On the first and last page I have drawn some kelp and barnacles in a slightly abstracted manner, leaving I hope enough room for the others to add their magic. Can’t wait to see what they add. I will keep you posted as we exchange and work on the three different books between us. What a lot of fun!